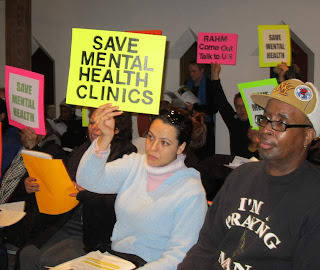 The Mental Health Movement Program works with mental health services consumers and providers and community members to erase the stigma of mental illness, preserve and improve city mental health services, and build the movement for the human right to healthcare. The Mental Health Movement is a coalition led by STOP and includes AFSCME Council 31, Illinois Nurses Association, Community Mental Board of Chicago and Next Steps. The Housing Justice Program works with subsidized housing tenant councils: the Kimbark Tenants Association, the Grove Parc Tenants Association, Island Terrace Tenants Association, Drexel Preservation Tenants Association and the St. Edmunds Tenants Association. Youth Justice Program works to nurture young people’s visions for change. Through the Youth Justice Program youth members plan and carry out their own campaigns: The Trauma Care Campaign and the Restorative Justice Reinvestment Campaign. 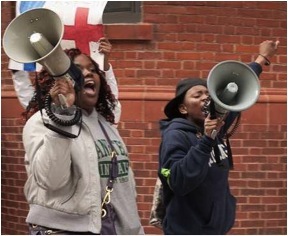 The Restorative Justice Reinvestment Campaign is a campaign to develop the leadership of youth impacted by juvenile detention to close the Juvenile Detention Center and replace it with alternative programs in neighborhoods where youth get locked up.